A commuter train travelling at high speed struck a crowd of people seated on tracks in northern India on Friday and at least 50 were feared killed, Punjab state police and witnesses said. 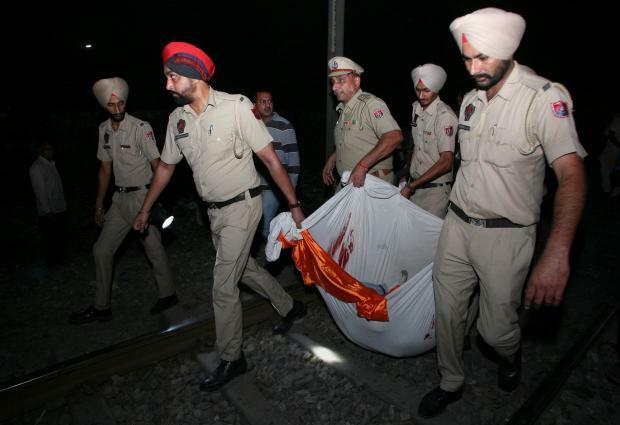 "The people were sitting on and near the tracks on the outskirts of Amritsar watching the burning of effigies as part of the Dussehra festival when a commuter train ran over them," a police officer told Reuters. At least 60 people were admitted to hospital with injuries, the police officer in the control room said, after what he called a "freak accident" given that people did not hear the train approaching amid the din of festivities and fireworks. ANI news agency reported that a witness at the scene said the train that ran over people was travelling at a high speed. "We have also ordered an enquiry as to why this incident has taken place," Singh told ANI, adding there still are conflicting reports on the death toll. A witness told Indian television channel Times Now that relatives of some of the deceased were picking up dead bodies by themselves and no proper rescue operations were currently on. Bodies of victims lay strewn around the scene and local television stations showed distraught and angry people, including a weeping mother who just lost a child in the tragedy. "Lot of students were gathered here and we can see so many unknown bodies lying around and there is not even enough light here even now," one person on the scene told a local channel. Prime Minister Narendra Modi said he was extremely saddened by the train accident. "The tragedy is heart-wrenching," he tweeted. "My deepest condolences to the families of those who lost their loved ones and I pray that the injured recover quickly. Have asked officials to provide immediate assistance that is required." India's state railways, largely built during colonial rule, have an appalling safety record after decades of underinvestment in rail safety infrastructure, as the priority has remained more on keeping fares low for the 23 million passengers who use the network daily. A derailment in August 2017, which killed 23 people, was the fourth major accident within the span of a year on the world's fourth biggest rail network.